Identification. The name "Thailand" is associated with the dominant ethnic group, Thai. Thailand was never under European colonial rule. It was an absolute monarchy until 1932, when it became a constitutional monarchy. In 1939 the country's name was changed from Siam to Thailand. Military dictators ruled the nation until the early 1970s; the military remained a powerful force in national politics into the early 1990s. Since that time, its role has diminished, and a new constitution was adopted in 1997. The military governments after World War II promoted rapid economic development and attempted to assimilate ethnic minorities. Rapid economic growth continued until the late 1990s, when the economic boom of the early part of the decade came to an abrupt end. As part of a trend toward devolution of authority, the democratic governments of the 1990s adopted more liberal policies with regard to ethnic minorities. However, members of ethnic minorities continue to face many problems in regard to political rights and economic security. Location and Geography. The Kingdom of Thailand has an area of 198,114 square miles (513,115 square kilometers). The country is commonly divided into four main regions and borders Burma, Laos, Cambodia, and Malaysia. The northern region is hilly, with much of its population concentrated in upland valleys and the flood plains of rivers; the dominant geographic feature is the Khorat Plateau. The southern region is a narrow isthmus with hills running down the center. The Thai (also known as the Central Tai) live mainly in the central region, with closely related groups of Tai-speaking peoples occupying most of the remainder of the nation. Smaller ethnic groups are scattered throughout the country, especially in the north and the northeast. Bangkok has been the capital since the late eighteenth century, when it replaced the earlier capital of Ayutthaya, which was sacked by Burmese invaders in 1767. With a population of almost 10 million, Bangkok is the most important city politically and economically. About twenty smaller regional cities have populations of two hundred to three hundred thousand. Demography. The population estimate for 2000 is approximately 62 million. There are about 75 ethnic groups, and approximately 84 percent of the population is Thai, including people from other Tai-speaking ethnic groups; the Thai, constitute about 36 percent of the population. The Thai-Lao account for about 32 percent of the population; their territory formerly was part of the Lao kingdom. The Lanna Thai account for about 8 percent of the national population. The Pak Thai constitute about 8 percent of the population. Other major ethnic groups include Chinese (about 12 percent of the population), Malay-speaking Muslims (about 3 percent), and Khmer (about 2 percent). The majority of the Chinese live in central Thailand, especially in urban areas. The Malay-speaking Muslims live near to the border with Malaysia. The Khmer live near the Cambodian border. total) near the border with Laos. Several small ethnic groups in the northeast speak Mon-Khmer languages; the largest of these groups is the Kuy (about 235,000). These groups have been largely assimilated into the Tai-speaking populations. In the south, there are small groups of so-called sea gypsies and aboriginal Malays (about 6,000 people). In the isolated inland areas of the south, there are about 1,000 forest-dwelling peoples referred to as Orang Asli in Malay. Linguistic Affiliation. Thai is a Daic language in the southwestern Tai group. Other Thai groups speak related southern and east-central Thai languages. Large-scale Chinese migration took place in the nineteenth century. Most of the Chinese in the country speak dialects of Min Nan Chinese. There are twenty-four Mon-Khmer-speaking groups, whose languages can be subdivided into four groups: Monic, Aslian, Eastern Mon-Khmer, and Northern Mon-Khmer. Seven Austronesian languages are spoken, all of which belong to the Malayic Malayo-Polynesian group. The main Austronesian language is Pattani Malay, which is spoken by about 2.5 million people in the southern region. The Pattani Malay, Malay, and Kedah Malay populations live in an area associated with the kingdom of Patani, which fell under Thai control in 1786. The nineteen Tibeto-Burman-speaking groups include nine groups that speak Karen languages. Three Hmong-Mien languages are spoken in the north. Various migrant communities speak Korean, Japanese, Tamil, and Urdu. Thai is the national language and the medium for education and mass communication. It is widely used by speakers of other Tai languages and is a second language for most other people. Symbolism. The most potent national symbols are the king and images associated with Buddhism. The monarch serves as the most important symbol of national identity and unity. Images of the king appear frequently in public and in people's homes, and he is featured often on television and the other mass media. His image is on all banknotes and coins. Showing disrespect for the king is a serious legal offense. Images of the Buddha and shrines are found in public buildings (including schools and government offices) and homes as well as temples. The promotion of Buddhism as a symbol of national identity has met with opposition from the Muslim minority. Emergence of the Nation. Evidence of an agricultural civilization with metallurgical capabilities has been found in northeastern Thailand; the earliest bronze artifacts date back to approximately 3,000 years ago. In the eighth and ninth centuries C.E. , Mon states influenced by Indian civilization occupied portions of central and northern Thailand, where they were referred to as Dvaravati. In Thailand, the most important Mon center was Nakhon Pathom west of Bangkok. Mon influence declined in the eleventh century as the Khmer invaded the area from the east. The Khmer occupied not only the Mon areas, but part of northeastern Thailand. As early as the fifth or sixth century, Tai-speaking peoples began migrating from northern Vietnam and southern Yunnan into areas adjacent to the Mekong River. The Tai in northern Thailand came into contact with the Mon, who converted many of them to Theravada Buddhism. Tai-speaking peoples gradually migrated southward and by the early eleventh century had moved into Mon territory. Tai peoples living in central Thailand came under Khmer control as the Khmer empire expanded. The Khmer referred to the Tai as Siams. The Tai in the vicinity of Sukhothai revolted against the Khmer rulers in 1238 and established a kingdom that promoted a writing system that formed the basis of modern Thai. In the wake of declining Khmer power, the center of Thai power shifted south to Ayutthaya, which was founded in 1351. In the north, the kingdom of Lan Na was founded in 1259. The Lao kingdom of Lan Sang was founded in 1353 and came to include much of northeastern Thailand. The founder of the kingdom of Ayutthaya, Rama Thibodi, promoted Theravada Buddhism and compiled a legal code based on Hindu sources and Thai customs that remained important until the late nineteenth century. Ayutthaya pushed into Khmer territory and sacked the capital of Angkor. Both Ayutthaya and Lan Na became strong and prosperous states during the latter part of the fifteenth century. After the deaths of the two rulers both kingdoms degenerated. Lan Na witnessed several civil wars and came under Burmese control. Ayutthaya was attacked by the Khmer and Burmese in the sixteenth century briefly came under Burmese control. In 1585, Ayutthaya began a period of rejuvenation. Starting with the establishment of a Portuguese embassy in 1511, there was a growing European presence in Ayutthaya. In 1765, the kingdom was invaded again by the Burmese; in 1767, the Burmese captured and destroyed the city. Thailand is a major producer of agricultural products. After pushing the Burmese back, the Thai established a new capital at Thonburi. Chao Phraya Chakkri became king in 1782 and founded Bangkok. The third Chakkri ruler established a system of royal titles, and named himself Rama III. During his reign, treaties were signed with the United States and some European countries, and Christian missionaries were allowed into the kingdom. Rama V (ruled 1868–1910) successfully resisted European colonization and introduced modernizing reforms. A group of young Thais who had studied abroad staged a coup in 1932 and transformed the country into a constitutional monarchy. From 1935 to 1945, a military dictator, Phibun Song-khram (commonly known as Phibun), ruled the country. Phibun changed the name of Siam to Thailand. In 1945, there was a brief return to civilian government, and the country's name was changed back to Siam. Between 1947 and 1973, the country was ruled by military dictators. After the brutal suppression of antigovernment demonstrators in 1973, military was forced out of office, but in 1976 it again seized power. In 1980, a more moderate government headed by Prem Tinsulanonda assumed office. Prem is credited with achieving political and economic stability. This period saw the end of a communist insurgency in the countryside, a gradual transition to democracy and economic growth. An election was held in 1988, but the elected government was overthrown by a military coup in 1991. Those who staged the coup appointed a civilian prime minister and a cabinet of civilian technocrats. A new constitution was passed in 1991, and an election was held in 1992, returning the country to civilian rule. After a subsequent period of political and economic instability a far more democratically reformist constitution was promulgated in late 1997. National elections were held under this constitution in early 2001. National Identity. In the twentieth century, the culture of the Central Tai came to dominate the national culture. The military dictator, Phibun, passed a number of Cultural Mandates that promoted a centralized national culture and identity. Other mandates promoted the use of the national dress and the national language. The term "Thai identity" was coined in the late 1950s. The Ministry of Education played an important role in expanding the national culture. The military government that seized power in 1976 viewed the national identity as something that had to be defended against Western cultural influences. A National Culture Commission was established in 1979 to coordinate efforts to defend the national culture. Those efforts were closely linked to national security and occurred against the backdrop of a communist insurgency that involved members of ethnic minorities. In the 1980s, a revival of regional and local identities began, especially in the northern and northeastern regions where there was a resurgence of local foods, celebrations, and styles of traditional dress. Democratic reforms and moves to devolve power since the early 1990s have allowed this process to accelerate. The sense of national identity is no longer viewed as precluding local and regional identities. Ethnic Relations. Thailand often is portrayed as a culturally homogeneous country, but there are approximately seventy-five distinct ethnolinguistic groups. The Central Tai is the dominant ethnic group and accounts for 36 percent of the population. The Thai-Lao and Lanna Tai, who together account for about 40 percent of the population, were not assimilated into the national culture until the twentieth century. There have been Chinese in Thailand for centuries. In the nineteenth century, their numbers more than doubled until they constituted about 10 percent of the population. Along with Westerners, the Chinese merchant class dominated the economy in the nineteenth century, especially with the exportation of rice. In the early twentieth century, the Chinese established their own educational institutions, resulting in antipathy toward them under the nationalistic Phibun regime, which blamed the Chinese for the country's economic problems. In 1938, the Phibun government taxed the Chinese, limited the use of their language in schools, and closed most Chinese-language newspapers. Chinese immigration came to a virtual halt. While anti-Chinese sentiment remained strong, by the 1970s virtually all the Chinese had Thai citizenship. With the growth of a more open and democratic society in the 1990s, the Chinese began to express their culture openly. Since it came under Thai control in 1786, the Malay Muslim population has posed difficulties for the Thai state. This region has mounted numerous rebellions against central authority over the past two centuries. In 1948, the Phibun regime banned Malay and Islamic organizations, sparking a rebellion that was violently crushed. Education has been a point of conflict between Thai authorities and the Malay Muslims since the government introduced compulsory education in 1921. As a result, many Muslims sent their children to Malaysia and other Muslim countries to be educated. In the 1960s, returning students joined various independence movements. Guerrilla activities in the south reached their height between 1970 and 1975. Counterinsurgency operations failed to end support for the separatists. In the late 1980s, the national political environment changed with greater sensitivity to the Muslim religion and culture. The civilian government elected in 1992 initiated reforms to ease tension in the Muslim south. The Thai government treats the Khmer as part of a generic northeastern Thai ethnic category called Isan. Efforts to assimilate the Khmer into the national culture in the 1960s and 1970s were spurred by concern over their support for communist insurgents in the northeast. In the 1990s there was a cultural revival among the Khmer in the northeast that included the formation of dance and music groups to promote Khmer culture. The hill tribes in the north, with the exception of the Lawa and Karen, are relatively recent immigrants. The majority of hill tribe members did not become citizens until recently and lacked political rights. These hill tribes have faced economic difficulties related to their lack of land rights. The authorities generally have viewed them as primitive peoples. In the 1980s and 1990s, there was encroachment on their land by lowlanders, who believed that their presence was a key factor in environmental degradation in highland areas. Proponents of rights for the tribes in the 1990s led to the granting of citizenship for the hill tribes. Nevertheless, there are many conflicts, including those involving corrupt government officials and business interests that are attempting to exploit highland resources. A little over 20 percent of the population lives in urban areas, including about ten million residents of the Bangkok metropolitan area. Over the last decade, regional towns have undergone rapid growth. Thailand's second largest city, with a population of around 300,000, is Nakon Ratchasima (also known as Korat). Until the early 1980s it was a relatively small country town, but industrialization has resulted in rapid growth. Other northeastern towns also have experienced rapid growth. Economic growth in the southern region (in part associated with the rubber, shrimp, and fishing industries) in the late 1980s and 1990s also resulted in sharp population increases. In the past, towns were centers of government administration, Chinese business, and the Buddhist religion, featuring government offices and housing for civil servants, Chinese shops and storage facilities, and Buddhist temples. The growth of the cities is reflected in a lack of planning and growing congestion, but the core features of the cities have not changed. Wood has given way to cement as the main building material, and new forms of architecture include high-rise buildings for offices and residences, and air-conditioned shopping malls. The 1980s witnessed the emergence of suburban housing developments and shopping complexes. There are few public parks, and urban planning is focused on building roads. The use of waterways for transportation is waning. Modern government offices are highly standardized to instill a sense of national unity, and even Buddhist religious architecture has become uniform. There were regional differences in houses, especially in rural areas, but these differences are disappearing. The traditional house is raised on a framework of wooden posts to provide protection from floods and intruders, and to create a multipurpose space under the house. This underpart served as a place for women to work, a place to sleep during the hot season, a storage space, and a place to keep domestic animals. The size and complexity of the raised area varied with the wealth and status of the family. The house is constructed of prefabricated units that fit together with wooden pegs. The raised part can be divided into an open area and an enclosed area. The open area includes a front veranda that is partially shaded. People usually sit on mats on the veranda. The rear of the house has an open balcony for washing clothes, doing laundry, and performing other domestic chores. This area also is used to lie out food to dry, and for spinning and sewing. The interior includes a living room and a sleeping space. People usually sit on mats, and there is little furniture. There may be a cooking area in the living room in smaller houses, but usually there is a separate space for cooking. In larger houses, there is a separate kitchen and granary. Food in Daily Life. Rice is the staple food at every meal for most people. All food is brought to the table at once rather than being served in courses. A meal will include rice, dishes with gravy, side dishes, soup, and a salad. Whereas in central and southern Thailand polished white rice is eaten, in the north and northeast people eat glutinous or sticky rice. Fish and shellfish are popular. Curries are eaten throughout the country, but there are regional varieties. Northern and northeastern food is similar to that of Laos and consists of more meat, including meat served as sausages, or as larb (a salad is usually made of raw meat). Chinese food has influenced the national cuisine, especially in regard to noodle dishes. Sweets are eaten as snacks. A popular snack is green papaya salad. In the past, there were marked differences between the food of the common people and that of the nobility. Women in noble households were proficient at decorative carving of vegetables and fruits. In recent decades, this practice has become popular among the middle classes. 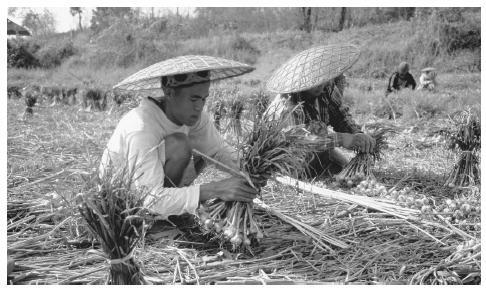 Whereas commercial alcoholic drinks are common throughout the country, non-commercial alcohol made from rice is still drunk. Basic Economy. Thailand has a relatively diversified export-oriented economy that grew rapidly in the latter part of the twentieth century until the crash of 1997. Manufacturing and tourism led its growth, but agriculture continued to play an important role—employing over 60 percent of the workforce. The country remains a major producer and exporter of agricultural products, including rice, rubber, and tapioca. Thailand's currency is called the baht . People observe a vegetarian festival. 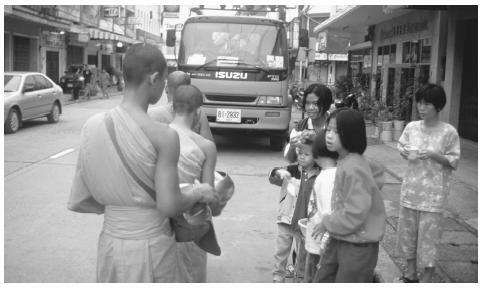 Eighty-five percent of Thais are Theravada Buddhists. Land Tenure and Property. In the past, all land was owned by the crown in theory, but individuals had use rights if they paid taxes on the land that they occupied. Because of the low population density, land ownership in rural areas was not a matter of concern. Large agricultural estates were rare. The commercial buying and selling of land took place in the main towns, where commercial life was concentrated. Urban land was often owned by Sino-Thais. In the 1950s, around 90 percent of farmers owned their own land. Strong nationalist sentiments influenced the 1941 Land Act, which made it difficult for non-Thais to own land. Informal means of circumventing these restrictions on land ownership helped create a chaotic system in which the title to land was difficult to determine. Under the new constitution and after the economic collapse, efforts were made to reform land ownership. Many restrictions on foreign ownership were removed, including those placed on Thais married to foreigners and their children. Commercial Activities. Thailand has a large and relatively modern commercial sector, with domestic and foreign commercial banks and a stock exchange. The 1997 crash resulted in the closing of some financial institutions and the consolidation of others. Producers of agricultural products traditionally sold their products through local brokers, but since the 1980s there has been a trend toward contract production for sale to large firms. Most towns and cities have small shops and traditional markets with small-scale traders who sell food, consumer goods, hardware, and medicines. In larger towns, shopping malls and large multipurpose stores have assumed a significant role since the 1980s. Major Industries. Major manufacturing industries include motor vehicle and motorcycle units and parts, computers, garments and footwear, electrical appliances, and plastic products. There also are large commercial farming and fishing industries. The main agricultural products are rice, tapioca, sugar, corn, and fruits. In addition to fresh and frozen agricultural products, food-processing industries produce canned and frozen products. Thailand has a large fishing industry and is a major producer of farmed shrimp. The country is one of the world's leading producers of rubber. Cement production is also important. Mining has declined in recent decades. The country produces some oil and natural gas but must import gas and petroleum products to meet domestic demand. It is a major center for cutting and selling gems. Thailand is Southeast Asia's top tourist destination, and that industry is the largest earner of foreign exchange. Japan is the largest foreign investor; the United States is also a major source of foreign investment. Trade. In the mid-1990s, exports were equal in value to about 25 percent of the gross domestic product. The most important exports are computers, integrated circuits, and related parts. Other major exports include electric appliances, garments, rubber, plastic products, shrimp, footwear, gems and jewelry, rice, and canned seafood. Major imports include nonelectric machinery and parts, electrical machinery and parts, chemicals, vehicle parts, iron and steel, crude oil, computers and parts, metal products, and integrated circuits. After the 1997 crash, the manufacturing sector declined sharply, especially the sectors that were highly dependent on imports, such as garments. By late 1998, however, manufacturing had begun to recover. The United States and Japan are the largest markets for the country's exports and suppliers of its imports. Neighboring countries, especially China, have become increasingly trading important partners. Division of Labor. The division of labor in the agricultural sector is based on gender, with little specialization by ethnicity. Ethnic Chinese have long played a major role in commerce and industry, but few jobs or professions are the monopoly of a single ethnic group. Traditional craft specialization is sometimes associated with specific villages or communities. Primarily ethnic minorities produce hand-woven textiles. Positions in modern technical professions such as medicine and engineering are related to education and specialized training and thus exclude members of the smaller rural ethnic minorities. Classes and Castes. In the nineteenth and early twentieth centuries, the social strata included an elite of Thai nobles, a small commercial middle class of Chinese and Europeans, and a lower class that included mostly rural farmers. With the development of a more modern economy, the structure of social stratification has become more complex. Noble birth continues to have some bearing on status, but the modern class system is based primarily on wealth. There now is a much larger middle class. The growth of towns and cities has given rise to a class of urban poor in addition to the traditional rural poor. In addition to regional differences in income, there are regional differences in income distribution: Income is distributed more equally in the center and south than it is in the north and northeast. Government. Thailand is a constitutional monarchy. The king, on occasion, involves himself directly in political affairs when national stability is threatened. Between 1932 and the early 1990s, the government was dominated by a military and bureaucratic elite. After the elections in 1992, political parties opposed to military intervention formed a coalition government, with the leader of the Democratic Party becoming prime minister. Parliament was dissolved in 1995, and the Democratic Party lost to the Thai Nation Party. That government lasted only until 1996, when a former military commander formed a coalition government and became prime minister. The economic collapse of 1997 led to the fall of that government and the eventual assumption of power by a coalition government led by the Democratic Party with its leader, Chuan Leekpai, as prime minister. A reformist constitution was promulgated in late 1997 with the intent to enhance participatory democracy. Attention has focused on eliminating corrupt political practices and devolving power. Devolution has included holding elections to a wider range of local offices. A National Counter-Corruption Commission was formed and given some powers to monitor electoral fraud. Thailand held its first national election under the 1997 constitution in January 2001. The newly formed Thai Rak Thai party led by Taksin Shinawatra, one of Thailand's richest men, defeated the Democrats and won 248 of parliament's 500 seats. The Thai Rak Thai party was joined by the smaller New Aspiration party to form a coalition with 325 seats. Voters appeared to have grown tired of Chuan Leekpai's six-party coalition government. They were lured by Taksin Shinawatra's promises of expansive economic policies, including his pledge to give every one of the country's 70,000 villages 1 million baht (about U.S. $25,000) in development funds. The election was fraught with corruption, which the National Counter-Corruption Commission proved to have only limited influence in curtailing. Leadership and Political Officials. The kings of the Chakri dynasty had numerous wives and concubines, resulting in the existence of a large number of nobles who were related to the king; in addition, some commoners were given high positions. In central Thailand, administration was directly linked to Bangkok and the king; in more remote areas, there were vassal princes. Below the government officials were freemen and slaves. The system was stratified, but social mobility was possible. People harvesting garlic in Mae Hong Song. Thailand has a largely export-based economy. After the advent of military rule and the end of the absolute monarchy in the 1930s, the state remained highly centralized, with government officials being appointed by those in power in Bangkok, primarily military officers and former officers. In the new system, power was gained through factional struggles within the military. The 1980s and 1990s witnessed the rise of "money politics," as wealthy civilians came to play an increasingly important role in politics. Increased democratization in the 1990s resulted in a much more complex political system. While wealth continued to be important, many major political figures claimed to speak for the poor, especially the rural poor. The newly formed government of Taksin Shinawatra is seen by some observers as a return to the old politics of wealth and patronage. Taksin is one of the country's wealthiest men and his party is held together mainly through an extensive patronage network. In the 1990s, a growing number of Muslims from the south attained elected political positions. Similar political gains have not occurred among the smaller ethnic minorities. Social Problems and Control. The government generally respects the human rights of its citizens. There is considerable freedom of expression, but there are laws that prohibit criticism of the royal family, threats to national security, and speech that may incite disturbances or insult Buddhism. The constitution makes it unlawful for the government to censor, ban, license, or restrict print or broadcast media except in times of crisis. While newspapers and periodicals practice some self-censorship, media criticism of public figures, political parties, and the government is widespread. Freedom of religion is protected by law. Thailand is no longer a significant producer of narcotics, but is still an important route for international heroin trafficking, and domestic consumption of narcotics has increased dramatically. Social problems associated with narcotics trafficking include money laundering, police and military corruption, and criminal activity by addicts. Political corruption is widely viewed as a serious problem. The National Police Department, with over one-hundred thousand personnel, includes the provincial police, metropolitan police, Border Patrol Police (BPP), and Central Investigation Bureau. The police force has a culture of corruption, and demands for bribes are routine. This corruption encourages illegal activities such as income tax evasion, gambling, drug trafficking, smuggling, and prostitution. Enforcement of the law is lax, but in many respects the police force works well. In general, the law requires that police officers making an arrest have warrants, and it is rare for police officers to be tried for extrajudicial killings or the use of excessive force. The legal system blends principles of traditional Thai and Western laws. In the Muslim south, Koranic law is applied. There are courts of the first instance, courts of appeal, and the supreme court, along with a separate military court. A constitutional court was created in 1998 to interpret the new constitution. There is no trial by jury. Career civil service judges preside over the courts, and supreme court judges are appointed by the king. Judicial appointments and structures are not subject to parliamentary review, and judges have a reputation for venality. Conditions in prisons are poor because of overcrowding, and medical care in prisons does not meet minimum international standards. Access to prisons is not restricted, and the government permits visits by human rights monitors and the Thai International Red Cross. Military Activity. Since 1992, the military's role in political affairs has been reduced. Responsibility for internal security and law enforcement is mainly in the hands of the police. The military's primary role is national defense, especially problems along the border with Burma. However, former senior military officers still account for a large percentage of the elected members of parliament and the military retains wide-ranging legal powers. The total strength of the military is around 270,000, including the army, navy, and the air force. In addition, there are about five-hundred thousand reserves. Male citizens between ages twenty-one and thirty are required to serve in the military for two years. Under civilian governments, defense spending has declined. Although there is a domestic arms industry, most military supplies are provided by the United States and Great Britain. Local, domestic, and international nongovernmental organizations are active in social welfare, heath, political reform, the status of women, the environment, religion, and business. Those organizations face few restrictions and are relatively free to publish their findings. Government officials generally are cooperative with such organizations. There continues to be discrimination against the hill tribes, which are widely viewed as being involved in narcotics trafficking. The Tribal Assembly of Thailand has lobbied the government for greater transparency in decisions affecting those tribes, especially in regard to the granting of citizenship and land issues. Division of Labor by Gender. Both men and women do agricultural work, and although some tasks tend to be assigned mainly to men or women, that division of labor is not adhered to rigidly. There is also some variation in the allotment of tasks according to region. In the north it is traditional for men alone to prepare land for planting and sow seeds, but in central Thailand, women sometimes perform those tasks. Women transplant rice seedlings in all areas, but sometimes men do that job as well. Harvesting is done by both men and women. Domestic work is done mostly by women. Weaving usually is done by women. Pottery, basketry, plaiting, making lacquerware, and making umbrellas can be done by men or women. 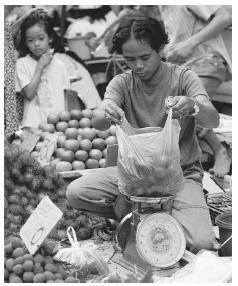 Small-scale market selling and itinerant trading are conducted by both men and women. Transportation of goods and people by animal, carts, boats, and motor vehicles is done mainly by men. Religious specialists and traditional healers generally are male. Traditional theatrical and musical performances involve both genders. In the modern professions, women work mainly in teaching and nursing. The Relative Status of Women and Men. Gender inequality is manifest in violence against women, societal discrimination against women, and trafficking in women for prostitution. Efforts to improve the status of women have increased, and the 1997 constitution provides women with equal rights and protections, although, some inequalities in the law remain. Domestic abuse affects women in all social classes. Specific laws concerning domestic violence have not been enacted, and the rules of evidence make prosecuting such cases difficult. Domestic violence often is not reported, since many victims and the police view it as a private matter. Sexual harassment in the workplace was made illegal in 1998, but only in the private sector, and no cases have been prosecuted. Thailand serves as a source, place of transit, and destination for trafficking in women for prostitution. Prosecutions for such activities are rare. 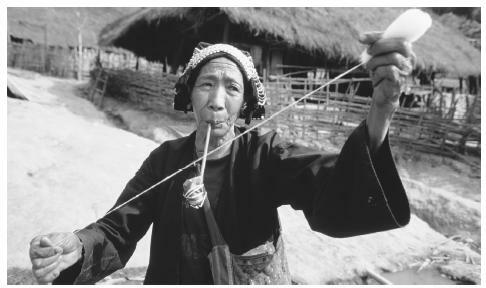 An Akha woman hand spinning wool. Though women have made many advancements in Thailand, they are concentrated in lower-paying jobs. access to higher education has grown. More than half the university graduates are women. Police and military academies do not accept female students. There is still a gap between the average salaries of men and women since women are concentrated in lower-paying jobs. There are no legal restrictions on women's participation in politics. While there have been improvements at the lower levels, women remain underrepresented in national politics. Marriage. In general, individuals find their own marriage partners, although the choice of a spouse may be influenced by one's family among the wealthy. The value of goods provided to the couple and elaborateness of the wedding ceremony vary with the wealth of the families of the couple. Polygyny was common among the elite in the past but is now rare, although wealthy and powerful men often have a de facto second wife known as a minor wife. Divorce is not difficult and is usually a matter of a couple ceasing to live together and dividing their property. Domestic Unit. The ideal is for a married couple to establish its own household as soon as possible. However, especially among poorer couples, residence with the parents of the husband or wife is common. The nuclear family is the core of the domestic unit, but it often includes members of the extended family. Including unmarried siblings, widowed parents, and more distant unmarried or widowed male and female relatives. The husband is nominally the head of the household, but the wife has considerable authority. Female members of the household are responsible for most domestic chores. Inheritance. Property generally is divided equally among the children after the parents die. However, it is common practice for one child, usually the youngest daughter, to assume primary responsibility for looking after the parents in their old age, and this person inherits the family home. Kin Groups. The Central Tai reckon descent bilaterally. Various forms of kin groups may be formed. The most common type is formed by siblings, married children, and sometimes more distant relatives living in a multihousehold compound. Members of these groups may share domestic and other tasks. Sometimes larger kin groups encompass several compounds to form a hamlet cluster. In some instances, a hamlet cluster forms around a wealthy and powerful individual. Footwear is removed when attending a ceremony near the Mae Nam Noi River, Thailand. Infant Care. Adults take a great deal of interest in children, including the children of other people. A mother keeps her baby with her whenever she leaves the house. Young children are pampered and given considerable freedom of movement and are allowed to handle almost anything that catches their attention. Weaning usually takes place when a child is two or three years old. Child Rearing and Education. Children in rural areas grow up surrounded by the implements that they will later use and see adults performing domestic, agricultural, and artisanal tasks. In the past, young boys attended school in a nearby Buddhist monastery, where they would be taught to read and write. Girl's education took place mainly at home as they learned to perform domestic tasks. After 1932, the government secularized the public school system by replacing monks with trained teachers. In the late 1990s, eighty-eight percent of children of primary school age were enrolled in schools and ninety-three percent of the adult population was literate. However, the economic crisis of the late 1990s resulted in an increase in the number of children leaving school. The government raised compulsory education requirements from six to nine years in 1999 and is attempting to improve educational standards. Higher Education. Institutes of higher education include comprehensive universities, technical institutes, and religious universities. Traditionally, education was handled by religious bodies. In the nineteenth and early twentieth centuries, a growing number of people went abroad for higher education. The first university, Chulalongkorn University, was founded in 1916. That university initially served mainly to train civil servants. An Arts and Crafts School was established in the 1920s. After the 1932 revolution, Thammasat University was founded. This was an open university with unrestricted admission and an emphasis on legal training. Chulalongkorn University tended to cater to the elite, while Thammasat University was more populist. In 1942, the Arts and Crafts School attained the status of a university, Silpakorn University. All three of these institutes are in Bangkok. A fourth institute was added in 1948 after the reorganization of advanced military education at the Chulalongkorn Royal Military Academy, whose graduates came to dominate not only the military but also politics. Admission to the military academy was restricted to "native Thai" until 1973, mainly to keep out ethnic Chinese. In 1960, less than one percent of the population had completed a higher education. In the 1960s and 1970s, new universities were founded, including the first regional university and a number of technical colleges and teacher training colleges. Buddhist educational bodies continue to play a role in education, offering not only religious education but a wide range of other subjects. There are also private universities which tend to focus on business education. There has been a boom in the growth of private higher educational institutes since the early 1990s, and plans are in place for the privatization of public universities. The Thai and other Buddhists follow the widespread Buddhist custom of not touching a person on the head, which is considered the highest part of the body. Patting a child on the head is thought to be dangerous to the well-being of the child. A person should not point the feet at anyone or at an image of Buddha. 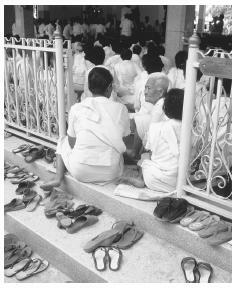 Footwear is removed when entering temple complexes, and it is polite to remove footwear when entering a house. Buddhist monks are not supposed to come into contact with women. It is traditional to greet a person with a prayerlike gesture called a wai . It is considered improper to lose one's temper or show too much emotion in public. Religious Beliefs. About eighty-five percent of the people are Theravada Buddhists, and the monarch must be a Buddhist. Virtually all Tai-speaking peoples are Theravada Buddhists, as are members of many of the ethnic minorities. The Buddhism of Central Tais often is referred to as Lankavamsa, reflecting its origins in Sri Lanka. Thai Buddhism, however, is a syncretic religion that borrows from earlier animistic beliefs, Hinduism, and Christianity. A noticeable manifestation of animism in Thai Buddhism are the spirit houses associated with almost all houses and buildings. These usually are small model houses placed on a pedestal, that serve as a home for the spirits associated with the site. These houses are decorated and presented with daily offerings. Many large trees also are considered to serve as the home of spirits and are decorated and given offerings. Approximately ten percent of the population is Muslim, primarily ethnic Malays in the south. Although Christian missionaries have been active in the country since the nineteenth century, only about one percent of the population is Christian. The Christian population consists primarily of non-Tai ethnic minorities in the north and ethnic Vietnamese and Chinese. There are small numbers of animists, Confucianists, Taoists, Mahayana Buddhists, and Hindus. Religious Practitioners. The majority of religious practitioners are Buddhist monks. Most young men become Buddhist novices and go to live in a monastery. While most young men remain at the monastery for a short time before returning to the secular life, some become ordained monks. A person who wants to become a monk is expected to be free of debt and certain diseases, have the permission of his parents or spouse, to agree to follow the disciplinary rules of the monkhood, and not become involved in secular life. Monks are expected to lead a life of aestheticism but commonly perform important functions in the community, especially as counselors. A variety of religious practitioners are associated with the animistic side of the religious beliefs of most Buddhists, including exorcists, spirit doctors, astrologers, and diviners. Rituals and Holy Places. A number of Buddhist religious festivals are held throughout of the country, and there are local events related to particular places and individuals. The Buddhist religious calendar begins with Songkran, in mid-April when images of Buddha are washed and monks are offered special alms. This celebration is marked by dousing people with water and festive behavior including dancing, singing, and theatrical performances. Visakha Puja in May celebrates Buddha's birth, enlightenment, and entrance into nirvana. The day includes the ceremonial watering of the banyan trees that represent the tree under which Buddha sat when he attained enlightenment. Asanha Puja celebrates a sermon given by Buddha. Khao Phansaa in July marks the start of the three-month lenten period. It is at this time that young males become novices. Lent is considered a period of spiritual retreat for monks, who are expected to remain in the monasteries. Thawt Kathin from mid-October to mid-November marks the end of lent. During this period, monastic robes and other paraphernalia are given to monks. In some communities, there is a celebration to produce new garments for monks and images of Buddha in which members of the community work together to produce the cloth in a single day. Magha Puja in February commemorates Buddha's preaching to enlightened monks. It culminates in a candlelit procession at temples. Death and the Afterlife. Buddhists believe that those who die are reborn in a form that is appropriate to the amount of merit they accumulated while alive. The cycle of death and rebirth is believed to continue as long as ignorance and craving remain. The cycle can be broken only through enhanced personal wisdom and the elimination of desire. Funerals involve either burial or cremation. 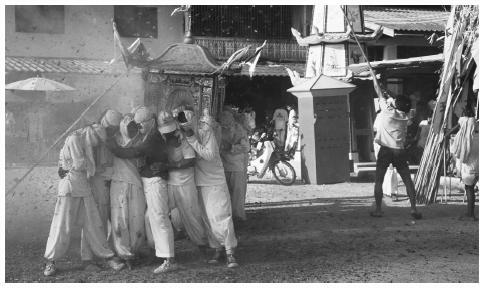 The funeral ceremony includes a procession of monks and mourners who accompany the coffin to the cemetery or crematorium, with monks chanting and performing rites along the way. Funerals for monks tend to be very elaborate, while people who have died a violent death are buried quickly, with very little ceremony, since their spirits are believed to linger after death as malevolent ghosts. The health of the population has improved over the last few decades, with increased life expectancy and lower rates of major diseases. An exception to this trend is the AIDS epidemic. The spread of AIDS is related to both sexual practices and narcotics use. The government has devoted substantial resources toward AIDS education and awareness programs and AIDS-related research. Buddhist monks walk down a street in Thailand. Most young men become Buddhist novices. The health infrastructure includes facilities and programs provided by the public sector, nongovernmental organizations, and the private sector. The majority of health resources are concentrated in urban areas, where a marked difference in access to health facilities depends on wealth. Private sector facilities exist almost exclusively in urban areas. Public health facilities in rural areas include district hospitals and community health centers. In small towns and villages, health care is provided mainly by village health communicators and village health volunteers who receive little training. In urban areas, private hospitals are becoming important providers for the wealthy and the middle class. In the 1990s, the government adopted a policy of self-reliance that included greater attention to classical traditional medicine and herbal folk medicine. A government sponsored, codified system of traditional medicine draws on elements of Chinese and Indian medicine. Many unlicensed healers practice folk medicine. Most celebrations are associated with the Buddhism or other religions. The most important secular holidays are related to the monarchy. Celebrations include Chakkri Day (6 April), commemorating Rama I, the founder of the Chakri Dynasty; Coronation Day (5 May), commemorating the coronation of the current king; the Royal Plowing Ceremony (second week in May), an ancient ritual held near the Royal Palace in Bangkok to start the rice-planting season; the queen's birthday (12 August); Chulalongkorn Day (23 October), held in commemoration of King Chulalongkorn (Rama V); and the current king's birthday (5 December). Other secular celebrations include Constitution Day (10 December) and New Year's Day. Support for the Arts. Support for the arts comes from both the public and private sectors. The Department of Fine Arts underwrites programs throughout the country, and there a national theater. Silpakorn University is the main public educational institution for the arts, and there is a national College of Dance and Music. The Foundation for the Promotion of Supplementary Occupational and Supplementary Techniques, founded in 1976, is associated with the queen and runs projects throughout the country for traditional artisans. There are private art galleries, mainly in Bangkok, and private auction houses have become a commercial outlet for paintings. Muslim fishing village on Koh Pannyi in southern Thailand. Literature. Written literature dates back to the Sukhothai period (1250–1350), and earlier traditions. The oldest known poem, the Suphasit Phra Ruong, was written in the late 1200s. The Traiphum Khatha (1345), is a treatise on Buddhist cosmology. Poetry from the fifteenth century includes epics, poems based on the life of Buddha, and the Lilit Phra Lo, Thailand's first love story. The reign of King Narai in the seventeenth century is considered the golden age of Thai literature. Most of this literary work consisted of epics and love stories written in poetic form. Cau Fa Thamathibet (1715–1755) is famous for so-called boat songs, which abound in mythical allusions. The eighteenth century saw the emergence of a new genre of poetry, lakhon. This was a type of theatrical poetry in which players positioned themselves before an audience and recited texts derived from the Ramakien (the Thai version of the Ramayana ), Inau (an epic of Javanese origin), and Anirut tales (which were more local in origin). King Rama II was a poet, and during his reign epics expanded in scale and in performance. There were some famous female poets during this period, including Khun Phum, who wrote a poetic eulogy for Rama IV. During the reign of King Chulalongkorn (Rama V), prose writing emerged and poetry became more realistic. Prince Damrong Ratchanuphap (1861–1947) compiled histories of Thai literature. The modern period has witnessed the emergence of many new forms of poetry and popular fiction. This fiction is realistic, often portraying the lives of common people and the underclass in the face of adversity. While most of the stories are set in central Thailand, there has also been regional literature, such as the novels of Khamphun Bunthami, which are set in the northeast. Since the 1970s a good deal of fiction and poetry has focused on social criticism. Graphic Arts. The graphic arts include art forms associated with Buddhist temples such as sculpture in wood, stucco, and stone; mural painting; and bronze castings of images of Buddha. Other forms of graphic arts include lacquerware, mother-of-pearl inlay, gold work, nielloware, silverware, wood carving, ceramics, basketry and plaiting, weaving, and painting on paper or canvas. In the Ayutthaya and Bangkok periods, there were distinct royal and common textile traditions. The nobility imported textiles from China, India, and Persia and received special textiles as tribute from neighboring regions. Commoners produced clothing for themselves until the nineteenth century, when imported cloth became widely available. There are still distinct regional styles of weaving that include the production of special hand-woven cloth for sale to elite customers in urban areas. There are many local, regional, and national weaving competitions and fairs to promote textiles. Painting traditionally was done in tempera in the form of murals on temple walls as well as on cloth and paper. While Buddhist themes were predominant, temple murals often included depictions of secular objects. Artistic styles initially were influenced by Sri Lanka and southern India and later were influenced by China and the West. King Chulalongkorn (Rama V) imported Western works of art and Western artists. Especially noteworthy were realistic painted portraits and statues of prominent individuals. In 1910, King Vajiravudh tried to revive traditional art, by creating the Department of Fine Arts in 1912 and the Arts and Crafts School in 1913. The Italian-born sculpture Corrado Feroci became a central figure in creating modern art in Thailand. As director of the Fine Arts University (Silpakorn University), he is widely viewed as the father of modern art in the country. The university held the first National Exhibition of Art in 1949, and this annual event became central in defining the state of contemporary art. Much of the work of modern Thai artists has mirrored trends in Europe and North America, but many artists have mixed imported styles with subjects associated with the national culture. Performance Arts. Classical dance developed from folk dances and incorporated elaborate Indian hand gestures and arm and leg movements, probably through the Mon and Khmer cultures. Various forms of dance, including masked dance dramas, are shown on Sukhôtâi stone inscriptions. The eighteenth century is considered the golden age of classical dance and dance drama. Although many musicians and dancers of Ayutthaya were taken by force to the Burmese royal court in 1767, those who remained behind taught their traditions to others during the early Bangkok period. Classical dance and drama were attacked by leftists in the 1970s because of their links to the aristocracy. When the military returned to power in 1976, it promoted classical art forms. In 1977, the military regime held a national festival of dance and drama that included classical forms and patriotic plays glorifying the country's past. In recent years, classical, folk, and modern dance and drama have been popular. Folk dances are regional in character. Each dance style is accompanied by different musical instruments. Dances in the central region have been influenced by courtly traditions. Southern dances have been influenced by Sri Lankan and southern Indian styles. Individual dance styles are associated with many of the ethnic minorities. Teaching, training, research, and publishing in the physical and social sciences are well developed. Most higher educational institutions offer courses in the physical and social sciences, and a number of government and government-sponsored institutes and agencies work in those fields. However, an insufficient number of university students are pursuing degrees in the physical sciences. The government has launched a number of programs to encourage students to go into the physical sciences. Askew, Mark. Interpreting Bangkok: The Urban Question in Thai Studies, 1994. Che Man, W. K. Muslim Separatism: The Moros of Southern Philippines and the Malays of Southern Thailand, 1990. Cohen, Erik. Thai Society in Comparative Perspective, 1991. ——. Thai Tourism: Hill Tribes, Islands and Open-Ended Prostitution, 1996. Gittinger, Mattiebelle, and H. Leedom, Jr. Textiles and the Tai Experience in Southeast Asia, 1992. Howard, Michael C., Wattana Wattanapun, and Alec Gordon. eds. Traditional T'ai Arts in Contemporary Perspective, 1998. Kemp, Jeremy. Hua Kok: Social Organization in North-Central Thailand, 1992. Keyes, Charles F. Thailand: Buddhist Kingdom as a Modern Nation-State, 1987. Kingshill, Konrad. Ku Daeng: Thirty Years Later: A Village Study in Northern Thailand 1954–1984 , 1991. Komin, Suntaree. Psychology of the Thai People: Values and Behavior Patterns, 1990. Lewis, Paul, and Elaine Lewis. Peoples of the Golden Triangle: Six Tribes in Thailand, 1984. Phanichphant, Vithi, Songsak Prangwatthanakun, and Patricia Naenna. Thai Textiles: Threads of a Cultural Heritage, 1994. Phillips, Herbert. The Integrative Art of Modern Thailand, 1992. Pitsuwan, Surin. Islam and Malay Nationalism: A Case Study of the Malay-Muslims of Southern Thailand, 1985. Poshyananda, Apinan. Modern Art in Thailand: Nineteenth and Twentieth Centuries, 1992. Reynolds, Craig J., ed. National Identity and Its Defenders: Thailand, 1939–1989, 1991. Rigg, Jonathan, ed. Counting the Costs: Economic Growth and Environmental Change in Thailand, 1995. Rutnin, Mattani Mojdara. Dance, Drama, and Theatre in Thailand: The Process of Development and Modernization, 1993. Skinner, G. William. Chinese Society in Thailand: An Analytical History, 1957. Tambiah, Stanley Jeyaraja. The Buddhist Saints of the Forest and the Cult of Amulets, 1984. Taylor, J. L. Forest Monks and the Nation-State: An Anthropological and Historical Study in Northeastern Thailand, 1993. Walker, Anthony R., ed. The Highland Heritage: Collected Essays on Upland North Thailand, 1992. Warren, William, and Luca Invernizzi Tettoni. Arts and Crafts of Thailand, 1994. Wenk, Klaus. Thai Literature: An Introduction, 1995. Wyatt, David. Thailand: A Short History, 1984.
this article is very nice and picture also if you show those picture in coloure they are locking beautiful.ok,and iI sugges you you write article about "Thai" children and their behaviour in education and socity with colour images. I found this article to be very helpful for my paper. I wouls love to know aout the Thai culture realted around the old age and health. Thank you much. Thank you very much. The informaton was very nice and the service was excellent. I hope you can take the time to visit the website, www.thai-food.in.th. &nbsp;It is only just beginning but I think you will eventually find it to be a great resource to learn about Thai food basics and beyond. im dating a thai woman i would like to know more of her culture before i take it forwould . your article here is the most informative ive read yet. Would like to know about Uganda's 52 Ethnic Tribes and their very rich CULTURES? How can Uganda inter-network with you in cultural activities? I Am very impressed by what you are doing! THANK YOU. It is very interesting.I would like to know how their buildings like.Anyway Thank you very much!!! Is there a news report or documentary interviewing families in the fishing industry who are happy with the structure of their lives? They employ their own children on the boats at very young ages, and they have no need to go to college. Once the children were encouraged to go to school and college, the family structure was destroyed. Some families complained. I would like to show examples of how cultures were negatively effected (according to their perspectives) by our influence to educate their children. Kindly provide me with any documentation illustrating this for I am writing a report for college. The article has a profound information based on it's major historical background. But, I just want to know, How important for the Thai people to keep track with their own language (Ofcourse, to mention the love for His Excellency and the country) and they do not mind learning the English Language in school? What do you think was the very reason and the roots of their disinterest to study the said language (which I think will open a wide venues of growth for the country and to its citizen to understand more and to be more rational thinkers as well), knowingly that there are highly accelerated numbers of Foreign Teachers in the country? What are those factors affecting them? More Power! Actually i want to know changes in Thai culture which has to be in normal language and i don't understand how to write it as , i have to submit journal to teacher by this Tuesday please can you help me out of this :) Thank You. Can you let me have any information you have on, the 10 day period Thai people have each year when they do not eat food containing dairy products, I think this period is called Jay 9 not sure of the spelling . I want to know are there nice women from kalisan which would be regarded as an isaan woman as alot of articles i read are not nice.my experience is theres good and bad everywhere in towns citys and countrys all over the world what is the truth? this is really good work. thank you for writing about this, my english class is thankful you wrote about this! I am doing a huge project on thailand and this has helped so much u have no idea love to learn more! The information is quite deep. Thank you so much. Thai traditional dancing may be roughly classified as folk dances & court dances. The folk dances are different among regions and among ethnic groups. Court dances have been developed for over 700 years since the Sukhothai Kingdom, mostly influenced by Khmer's court dances and the Hinduism legend called "Ramayana." I'm sure the Ministry of Culture has more details about this. The Mon history within Thailand was a plus to learn. Great range of info. Thanks! I found more information on my research on this. I've got a school project about Thailand and have been struggling until I found this site. Can you please tell me who wrote this article and the date it was published? I need to know to be able to cite the information in my project!